Check out the first six and a half minutes of this video from Acoustic Addicts where they talk about Acacia koa and its acoustic qualities as a tonewood. Very interesting and entertaining. The rise of blackwood as a quality tonewood is largely due to the heritage of Koa and the Hawaiian music craze of the 1920’s. As the supply of Koa timber from Hawaii continues to decline so the fortunes of blackwood as a quality tonewood continue to rise. If only!! Headlines like this should have been appearing regularly in our newspapers over the past 20 years or more. Q. Why would publicity like the headline above be important to the forest industry, and what would be the benefits to the Tasmanian community and particularly to the rural community? The winning entry will be posted on this blog and will receive a free bottle of Tasmanian wine. YES I’M SERIOUS ABOUT THIS! However instead of this kind of major market profile one of the great disincentives to investing in forestry in Australia is the lack of proper market processes that provide information on price, demand, quality, and markets. Without this basic fundamental information it is very difficult to justify long-term investments in planting trees for wood production. There are other benefits to both the forest industry and the community that I hope readers will help to expand on in the coming weeks (see above competition). So when was the last time anyone saw a forest products market report in Tasmanian Country? No I didn’t think so! The Blackwood Growers Cooperative appreciates that issues of market competition, transparency, product differentiation and segregation are critical in achieving the best financial outcomes from our forests and plantations. They are also vital in stimulating investment in forestry, especially given the long investment periods involved. One of the key objectives of the Blackwood Growers Cooperative, as part of its strong commercial focus, will be to increase market information to allow farmers to make better informed investment decisions and improve the profitability of blackwood plantations. As Australia’s premium appearance-grade timber species the market for blackwood logs should be as transparent and competitive as possible to help stimulate value-adding and investment. Instead the opposite situation prevails. Nevertheless there are enough snippets of information available to provide some comfort that blackwood plantations will be a profitable investment. 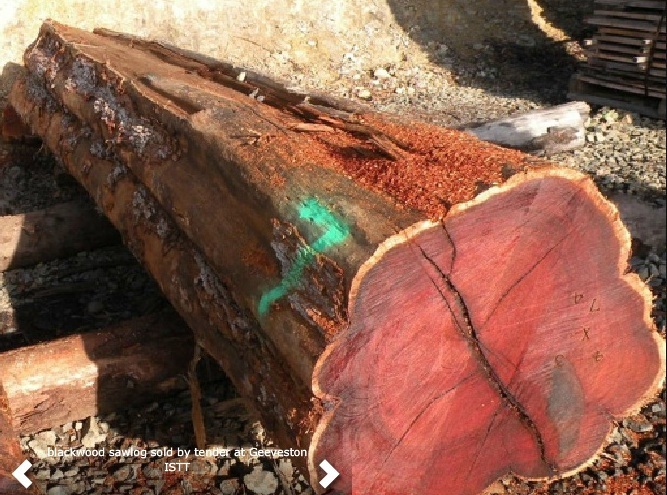 Island Specialty Timbers (IST) (islandspecialtytimbers.com.au), run by Forestry Tasmania, is one of only two forestry organisations to provide publically available competitive log price data in Australia. IST holds regular public tenders for small parcels of specialty timber logs including blackwood, and publishes the results. These are not stumpage prices but could be regarded as indicative “mill door” prices. The Tender Prices provides information by species and broad quality classes on logs that have been sold by public tender. IST “generally only offers material for sale by tender whose quality is very good or better”. However there are no real log quality specifications (eg. Heartwood colour, density, figured grain, log diameter, length) so the relationship between price and log quality is pretty vague. It is expected that plantation-grown blackwood timber would generally be equivalent to “plain grain” quality. So good size and quality “plain grain” blackwood logs are currently selling for ~$500 / m3 mill door. Unfortunately IST does not present any time series price data to track changes in the market over time. Is the price for blackwood increasing or decreasing? Is it seasonal and subject to availability? These questions are important to potential growers. How applicable are IST prices to plantation-grown blackwood? Research has shown that blackwood timber from native forests is very variable in quality, ranging from very poor to very high quality. This is due to both environmental and genetic factors. The same is also true of plantation blackwood timber at the moment, because there is not yet a blackwood breeding program. Research has shown that blackwood can be grown in plantations without any negative impact on wood quality, so it comes down to genetics and the site. As for markets it becomes a matter of matching expectations with reality and price. Is plantation blackwood timber fit-for-purpose? There are indications that New Zealand farmers are having no trouble selling good quality, plantation-grown blackwood timber into their domestic market. However the volumes being harvested are still too small to establish a market price. Given the tiny volumes sold by tender by IST how indicative are they of general market prices? A very important question and one that seems impossible to answer. Some time series data from IST on blackwood log prices would help shed some light on the problem. If real prices have been increasing over time that would be a positive indication. Another aspect affecting blackwood price is future supply. The Forestry Tasmania 2010 Special Species Strategy estimates 10,000 m3 per year of blackwood sawlog supply from public native forest until 2019. After that year no figures are available. Most of this blackwood will come from harvesting of mature eucalypt forest. Regrowth eucalypt forest has little or no blackwood sawlog. So regardless of the outcome of the forestry IGA the production of blackwood sawlog from public native forest will decline. This will have a positive impact on prices. New Zealand farmers are expecting to harvest approximately 300 cubic metres of premium plantation blackwood sawlog per hectare after a 35 to 40 year rotation. Using the IST indicative price of $500 / m3 for quality plain-grain blackwood that equates to $150,000 per hectare mill door value. Subtract harvesting and transport costs to get an approximate price at stump. Imagine what the value per hectare would be if we can clone and grow fiddleback blackwood (see further discussion below). I expect that once significant volumes of plantation blackwood timber start to appear in New Zealand in the next few years that a transparent competitive market price will become established. This will help us to understand the blackwood market and encourage investment in blackwood plantations in Tasmania. The New Zealand Farm Forestry Association is gearing up to help farmers market the growing volumes of minor species including blackwood, that are expected to become available in the next few years. As a consequence of promoting the Blackwood Cooperative I am starting to get regular enquiries from sawmillers, furniture makers and other customers looking for sources of blackwood timber from private landowners. These people understand that current and future supplies of blackwood timber from public native forest are limited and precarious. Some of them also want to reduce their exposure to the perpetual political risk inherent in the public native forest industry. While this is not my current focus, I am certainly happy to help connect blackwood growers with potential customers. Plenty of Tasmania farmers already have blackwood trees and stands on their properties. Some of these will have immediate commercial value. If you are a farmer wanting to understand the commercial value of your existing blackwood and how it can be realised/improved please contact me (mob. 0428 754 233). · trees that have wood qualities that meet particular high-value niche markets (eg. the tonewood market). All of these objectives are aimed at improving the profitability of commercial blackwood plantations. One example is that of fiddleback blackwood. Over the years I have known people who have made attempts at cloning fiddleback blackwood. I believe this can be done, and with the very high prices paid for fiddleback logs, the commercial potential is obvious. The Blackwood Cooperative would form the natural focus for this kind of commercial research. Another example is the tonewood market. A huge amount of research has been done and continues, into the relationship between wood quality and its impact on the sound quality of stringed instruments. The acoustic guitar market is the main market for blackwood tonewood. Guitar makers worldwide are facing declining supplies of quality tonewoods and are looking for sustainable supplies. Prices for quality tonewoods are increasing. Blackwood is one of the few established quality tonewoods that can be grown in commercial plantations. The opportunities to supply this market and to cooperate to develop selected genetic lines to meet tonewood market requirements seem obvious. Apologies for such a long blog. I hope you found it interesting. And please enter the competition for that great prize. Taylor Guitars based in San Diego, California, are one of the major American makers of acoustic guitars. Here is their latest model guitar featuring Tasmanian blackwood. Blackwood tonewood timber retails for >$50,000 per cubic metre sawn, compared with normal furniture grade blackwood that retails for ~$4,000 per cubic metre. At these prices the tonewood market has the potential to have a significant impact on the commercial future of blackwood. All we need to do is realise that opportunity. Help us to realise that future by supporting the Blackwood Growers Cooperative. Although this article is now 6 years old it is still a good summary of blackwood growing in New Zealand. Ian Brown is coauthor of the New Zealand blackwood growers handbook. As a farmer his research has helped define the current success of blackwood in NZ. His comment about blackwood growth rates in NZ compared vs Tasmania should not be taken too seriously. Undoubtedly NZ has some very good sites for growing blackwood. But we have yet to really test the potential here in Tasmania.